Philosophers should make a comprehensive study of Valentino Garavani, because if he isn’t a genuinely happy man this proves human happiness is an unobtainable ideal. The great couturier retired in 2008 at the peak of his fame, adored by the world’s most glamorous and influential people. His life-style, as revealed in Matt Tyrnauer’s documentary, Valentino: The Last Emperor, is as lavish as royalty, but without the boring official duties. He has homes in London, New York, Paris, Rome, Gstaad and Capri, manned by a battalion of assistants who cater to his perfectionism. Even his private life is a marvel. 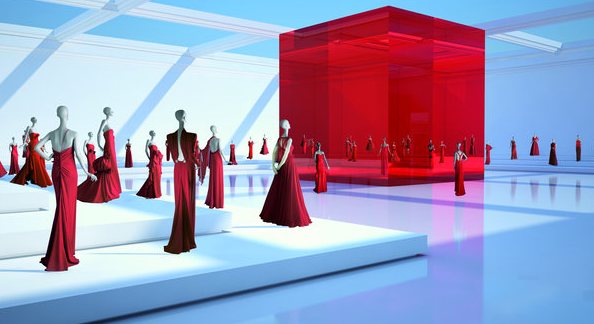 Valentino has enjoyed a stable relationship with Giancarlo Giammetti for more than forty years – and together they have built a worldwide business empire. The couturier made his farewell to fashion with a grand exhibition at the Museum of the Ara Pacis in Rome and Les Arts Décoratifs in Paris. Until 14 November Valentino Retrospective: Past/Present/Future, may be seen in that other international fashion capital – Brisbane. Over the past two decades the world’s leading art museums have succumbed to the pulling power of fashion. All the leading labels have had their moment of glory, although very few of these shows have been seen in Australia. Two outstanding exhibitions we did see were the Vivienne Westwood retrospective at the National Gallery of Australia, and the Powerhouse Museum’s survey of Japanese fashion called, The Cutting Edge, both held at the end of 2005. Valentino presents a rather different proposition. Where Westwood and the Japanese designers are distinguished by their riotous invention, Valentino is a classicist. In practical terms this means that most people will find his clothes more wearable and appealing. So while a woman might hesitate to attend a function dressed as a Westwood buccaneer, or wearing a huge Rei Kawakubo artificial hunchback, a Valentino cocktail dress could not be bettered. This is something that I understand and accept, but from an art critic’s perspective I confess a strong preference for Westwood and the Japanese. It’s partly because, as Valentino himself admits, he is a designer “with only one story”. That story is one of feminine beauty and “timeless elegance” – a phrase repeated so often in relation to Valentino’s work that it verges on cliché. The preface to the lavish book that passes for a catalogue of this exhibition notes that Valentino has “eschewed innovation for its own sake”. French curator, Pamela Golbin admits that he is “no revolutionary”. Compare this with Vivienne Westwood, who once said: “the only thing I really do believe in is culture.” While Westwood would like us to see her extravagant clothes as a criticism of “the banality of everything else”, Valentino seems perfectly happy with the status quo. One might see Westwood’s ‘culture’ claims as merely pretentious and Valentino as a shrewd businessman. But it is precisely that lack of craziness, the pervasive sense of reserve and good taste that makes Valentino less of an artist and more of a designer. If we understand good design as that which matches an object with a particular purpose, then he is unrivalled. If you have the occasion and the capital, Valentino has the frock. But if fashion is going to hold its own in a contemporary art context, something more daring is required. One looks for an occasional acte gratuit, as defined by the novelist, André Gide – an unmotivated act that defies normal explanation. André Breton, leader of the Surrealists, thought that the ideal acte gratuit would be to fire a revolver into a crowd, but in fashion terms it could be as simple as a line that disturbs the seamless perfection of a design. In one scene in The Last Emperor, Valentino decides to leave a couple of rows of sequins off the back of a dress only to have Giammetti and others protest at this deviation from the norm. The sequins are restored and equilibrium maintained. The very idea of ‘timelessness’ can scarcely be reconciled with fashion’s seasonal cycles, which demand a new look every year. In reality it is a matter of which bits of previous looks are ripe to be cannibalised and reused. Valentino’s answer to the need for perpetual novelty has been to work with a limited palette, creating entire ensembles in red, white or black. He avoids radical changes of direction, but always maintains that trademark elegance. For the vast majority of the population, haute couture will never be anything more than a vicarious fantasy. We watch the parade of supermodels, Hollywood starlets and celebrities on our television screens, and take a passing interest in their frocks. Within a few months – or minutes – the most popular items will be adapted and marketed by more affordable fashion houses. The real money is in the ready-to-wear ranges, accessories and perfume, but the unique, designer dress is where a couturier makes his or her reputation. In this arena, Valentino has been consistently brilliant, being rewarded by the patronage of the rich and famous. His most loyal and influential client was probably Jacqueline Kennedy, whom he refers to as his “muse”. As First Lady in the White House she commissioned an entire wardrobe from Valentino. When she married Aristotle Onassis, it was in an understated Valentino creation that must rank as one of the least interesting pieces in this show. 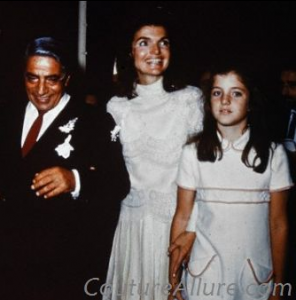 One can hardly imagine any celebrity wearing it, let alone Jacky Kennedy at her wedding. By contrast, look at a pale linen suit from the same year of 1968, covered with white tiny flowers. The outfit belonged to Audrey Hepburn, and it could not be more perfectly matched to this petite star. It was a matter of some small inconvenience to Valentino that he was trying to launch a new range in Paris at the same time students and workers were marching in the streets calling for a revolution. Yet fashion has ultimately proved more resilient that than the radical politics of that era. Readers may draw their own conclusions as to what this says about human nature. Valentino has been more entranced by the cinema than by politics. He was originally inspired to become a designer after watching the glamorous women in the Ziegfeld Follies. He has remained a favourite among actresses from the time he dressed Monica Vitti for Antonioni’s 1961 film, La Notte, during the heyday of Cinecittà studios. Elizabeth Taylor and Sophia Loren were early clients, and many of his best gowns have been paraded on stage at the Academy Awards. Julia Roberts accepted an Oscar for her role in Erin Brockovich in 2000, wearing a ‘vintage’ Valentino dress. Among the Australians, Nicole Kidman, Naomi Watts and Rose Byrne have all favoured Valentino. When Cate Blanchett received an award in 2005 for her role in The Aviator, she wore a stunning yellow dress that is featured in this show. One thinks more favourably of Valentino’s relentless elegance in comparing this yellow dress to the off-the-shoulder, crocheted granny rug the actress wore to an event at the Australian Centre for the Moving Image last year. That costume earned her the fleeting nickname, “Cate Blanket”. There are a hundred dresses in this exhibition and allowing for the odd extravagance of the sixties, such as zebra or giraffe hide motifs or patterns swiped from blue Delft china, “timeless elegance” is the dominant note. But Valentino is not short of surprises: one of the most striking pieces is a pink evening dress with bunches of billowing silk around the neck and sleeves. This appeared as late as 2007, and acts as an effective riposte to anyone who might have thought the aging maestro was losing his touch. Retirement, as we see in the documentary, is not a state that Valentino welcomed. It is a measure of Valentino’s sun-tanned charm that the book that accompanies this show, the wall labels and the publicity, are so respectful and admiring they might be called sycophantic. Sometimes it feels as though one is reading a prospectus to clients. A time line in the centre of the show is little more than a list of Valentino’s honours and awards. Not many of his peers have been able to maintain their own immaculate images so successfully over the course of a career. While his old friend, Karl Lagerfeld, has cultivated a persona that would be at home in a Hammer horror flick, Valentino would fit in anywhere and always be the best dressed man in the room. His retrospective may not be profound but it’s almost certainly the greatest frock show on earth.